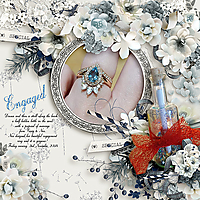 Created with "Nordic Winter"... Pickled Pairs Collab by Digital couture Designs & Reginafalango. Perfect composition in the center of the page. The white wood background gives the deserved highlight. The shading on the elements is wonderful. totally smitten by this page. That is the sweetest little fox all curled up. 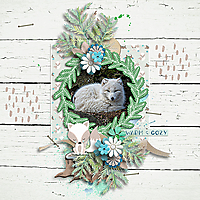 Love the wreath framing and soft colors. That ribbon is shadowed so perfectly and the brushes look great on the wooden bg pp. such a beautiful picture, I just want to go and pet him. 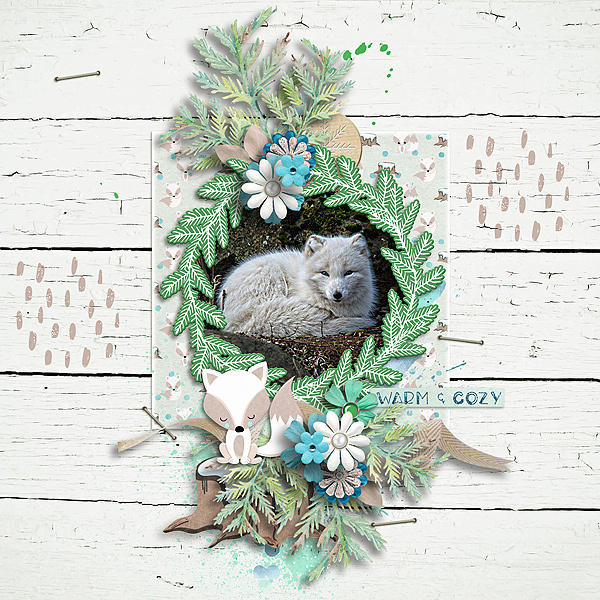 I love the vertical composition of your layout, and the great way the wreath is framing the picture. The color palette is lovely too. Wonderful page and cute photo! Love the evergreen branch frame and the clusters. The wood background is the perfect choice.